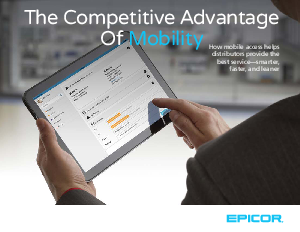 > Epicor > Mobile Technology Gives Distributors a Competitive Advantage-Are You Keeping Up? As mobile devices become increasingly essential to our working lives, your business—and your enterprise resource planning (ERP) system—must connect to these vital tools or risk losing to the competition. When employees can use their preferred devices to access information on demand, distributors like you can improve employee collaboration, increase productivity, and deliver exceptional customer service. Download the eBook to learn how else you can capitalize on greater mobility and grow your distribution business.